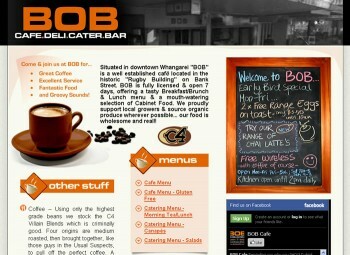 Situated in downtown Whangarei “BOB” is a well established café located in the historic “Rugby Building” on Bank Street. BOB is fully licensed & open 7 days, offering a tasty Breakfast/Brunch & Lunch menu & a mouth-watering selection of Cabinet Food. We proudly support local growers & source organic produce wherever possible… our food is wholesome and real! !